When it comes to fish tacos, there’s nothing better than making them from recipes with fresh tuna. And when it comes to fish tacos recipes, there’s nothing better than crispy fish tacos. That delicious fried crispy shell, and your fresh tuna, have all the makings of a great fish taco. It’s January, so you’re probably wondering why a tuna taco recipe now? In case you haven’t been listening to Let’s Talk Hook Up, on the mighty AM 1090, fishermen are hauling in 60-90 pound bluefin tuna just a few miles off the coast of SoCal! And with that much tuna getting stuffed inside our freezers, recipes with fresh tuna are a must have. 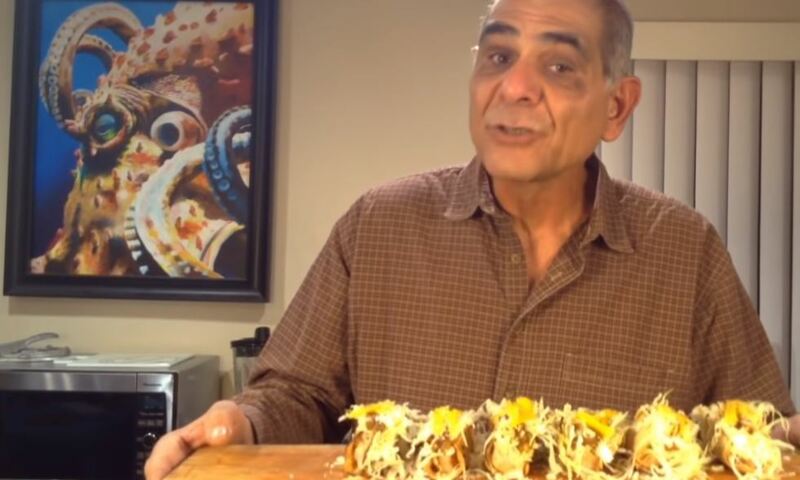 My new recipe teaches you how to make crispy taco shells and a very authentic “arbol” spicy salsa with mango. This combination, with your fresh tuna, will put your kitchen on the culinary map, believe me! Start with heating your skillet (or frying pan) and heating about 4 cups of water in a medium sauce pan. No need to bring the water to a boil, just warm it up. Begin heating the dry arbol chilis in the skillet. Warning: Make sure your kitchen is ventilated, since the smoke coming up the arbol dried peppers may cause you to cough, a lot. Toast the arbol chilis only for 2-3 minutes and then toss them into hot water (that will stop them from giving up fumes). Turn off the flame heating the water and allow the chilis to reconstitute with the warm-to-hot water for 10 minutes or so. Back to the hot skillet (with no oil). Now begin to add the tomatillos and allow them to pan roast. Rotate the the tomatillos while allowing them to blister. When the tomatillos are almost completely blistered, add in the cloves of garlic. Now allow the garlic to cook and soften on both sides, just a minute or two and then, you’re done. Now add the tomatillos, garlic, and arbol chilis into a blender. Next add a pinch of salt and 3/4’s of the mango. Finally add ¼ cup of water to get the salsa to have a thick soup consistentency and then start blending. Now, begin to warm the tortillas by placing them directly on top of the lit stove burners. Remember to heat both sides until there’s a little char starting to develop on tortilla. Set aside in a tortilla warmer or wrapped in tin foil. Place the flour into a plastic bag and then add a pinch of salt. Shake the bag and then add the cut pieces of tuna. Shake the bag to ensure all the pieces of tuna are well coated with flour. Now, use a large slotted spoon out a portion of cubed fish (2-4 pieces) into the middle of a warmed tortilla. Finally, fold the tortillas over, and use 1-2 tooth picks to pin the tortilla closed. Heat a 1/2-inch of oil in a frying pan, over a medium heat. When the oil is ready, place the tacos in the frying pan. Remember, don’t overcrowd your pan. Now, fry for 2 to 3 minutes on each side. Remember to check the color of tortillas as they’re frying. When the tortillas are finished cooking, allow the tacos to drain in a paper towel lined platter. Finally, remove the tooth picks from the tacos and split them open. Now begin to fill each taco with cabbage, then top with the arbol sauce. 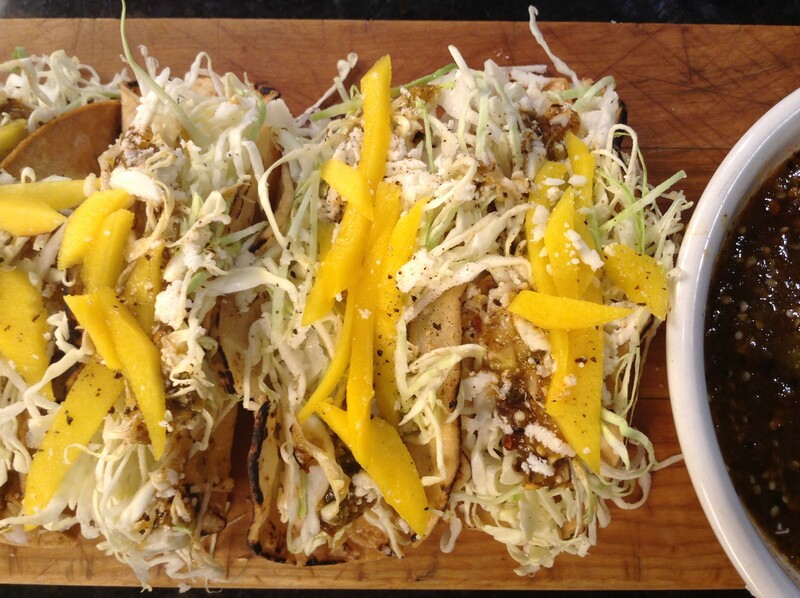 Toss on grated Cotija cheese and finally, garnish with small cut slices of mango and cracked black pepper. Enjoy!